An eyewitness, on a basic level, is somebody who "witnesses" something with their "eyes". On a more complex level, it is somebody who "witnesses", as in, observes an event, "something", i.e. an event, generally an important event, with their...um..."eyes." Do not ask me to go into a more complex level, that is what Wikipedia is there for. Eyewitnesses, (the people who witness the events with their eyes), are often of vital importance in a court case. (See Michael Jackson). 3 How Do I Become An Eyewitness And Receive This Protection? You know, it's gobsmacking to think that crimes like that could happen in a place like this. On July 22nd, 2008, in Brooklyn, New York City, at 11:06pm local time, a late night convenience store was robbed. A man walked into the shop with his hood up, forced a gun in the face of Mr. Lebowski, the owner, and demanded he empty the till. Mr. Lebowski did empty the till, and then was shocked to see the man run away with the contents. "Not even a please, or thank you, or anything!" he said. Naturally, the whole of New York was in uproar, unable to believe that such an event could possibly be allowed to happen without the interference of Spiderman or the NYPD. The owners, Mr. and Mrs Gregor Lebowski, appeared on national TV asking if anyone had seen anything that night. Quite a few people replied saying that they had seen many things, thank you very much, in fact one had even listed everything important he'd seen: a man walking a dog, a half-eaten donut on the floor and the seat of a park bench. However, only one person had seen anything important. The eyewitness, who wished to remain anonymous, had been walking past the shop when the trude inruder rude intruder entered. He used his eyes to witness the attack, and was able to take a mental photograph of the attacker (male, young, Nike hoody, gun) which helped the police narrow down the list of suspects to 2,756,630. However, the eyewitness also managed to witness a very important detail - the words "Property of Mrs Doris Goldman, please return to Flat 96, East 131 St" written on the side of the gun. Over three months later, the police told the Lebowski's they knew who had committed the crime - Mrs Doris Goldman, an 82-year-old. They even knew where she lived. Doris Goldman protested her innocence throughout the trial, stating it was her young, male, Nike-wearing next door neighbour who had stolen her gun. The jury, however, found her guilty, and she was executed for the theft of $4.58. This could be your new Government-standard identity reallocation haircut! It's quite tough, but can you guess who this person was before the hair?? Here is a comprehensive list of all the measures taken to ensure that all eyewitnesses are kept safe from such problems as angry, vindictive murderers, opportunistic rapists and faulty toasters. 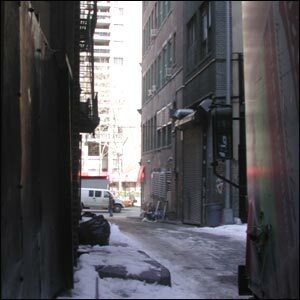 Relocation – all eyewitnesses will be moved to a secret location somewhere in New York (231 East 73rd Street). To enable the police to find it easily when they need to talk to the eyewitness, this location will be marked on all maps and Sat Navs as “Eyewitness Protection Service – Relocation HQ.” There will also be a plaque above the door. New Identity – all eyewitnesses will be provided with a new identity. To avoid confusion, all names will be kept the same bar a few letters – i.e. Peter Pakrinov would become Petey Pakrinof, and George W. Bush would become George V. Bush. Toaster – all eyewitnesses will receive a new Bosch Toaster 3000! How Do I Become An Eyewitness And Receive This Protection? Many people want to be eyewitnesses and receive protection (and toasters). In fact, over 95% of children aim to become either a footballer, singer or eyewitness. However, becoming an eyewitness is not as easy as it sounds. First all, you have to have to have two eyes. This is vital. One-eyed witnesses often get thrown out of court, especially when they enter in the middle of court proceedings, asking for directions to the library. There have been no witnesses with one singular eye throughout the history of the US courts and very few in British history (though the Guardian has reported about three eyed witnesses in the Princess Diana case, it is believed the "d" was a typing error). Secondly, you need to position yourself somewhere where crime is likely to happen. For example, the USA, or China. Then you have to wait, with your eyes peeled. Do not literally peel your eyes, this is painful and a waste of your time (plus the eye peel tastes disgusting, even in cakes). Simply sit, and watch. You may get bored. In fact you are very likely to get bored. Only professional eyewitnesses can keep their eyes peeled for long periods of time, such as years. You, however, as a novice, will probably give up after an hour, so just go and try something else if you are not good enough for a professional eyewitness. Try being a footballer, its way easier. 98% of eyewitnesses are referred to in the eyewitness business as "opportunistic eyewitnesses" - they witness with their eyes only randomly out of the blue, without even planning for it. They have not endured the long hours of sitting and watching, yet they still reap the glory and protection. These people are the envy of professional eyewitnesses, and are often hunted down and murdered by eyewitnesses who really wanted to witness that particular crime. This has lead to eyewitness protection. Most of the public believe the Witness Protection Act was put in place to protect harmless eyewitnesses against the murderers who committed the murders they witnessed with their eyes. However, the Witness Protection Act more often than not protects opportunistic eyewitnesses from professional eyewitnesses. Also, try saying those last two sentences five times fast backwards.